It started with a phone call. Deborah Stevenson, who lives in California, called to ask about sending copies of my book For Every Cat An Angel to some friends. 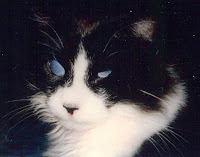 Deborah told me about the loss of MA, her beautiful blind kitty, who had left this life on March 11, 2009. Her story touched my heart deeply. 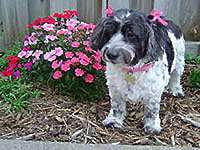 “MA, named after the Divine Mother, was born in 1997 and left at the local pound 4 years later. She was born blind and was unwanted. I was moved to go to the pound in 2001 and found MA. Deborah told me in the evening she would walk MA on a leash through the neighborhood, and how much everyone adored her beloved kitty. All you have to do is look at these pictures of MA to see how special she was. As it says in The Little Prince, “What is important can only be seen with the heart.” MA understood this. We will miss you, MA.